For grain exporting nations like Canada, identifying grain quality for sale is a vital step in the successful marketing of a crop. Being able to segregate the crop by quality, and being able to maintain those segregations through the handling system and into the end user’s control, facilitates the export of grains as well as price determination. In Canada, this system was written into legislation in 1874 and is currently regulated by the Canadian Grain Commission (CGC), a federal government agency, under the Canada Grain Act. 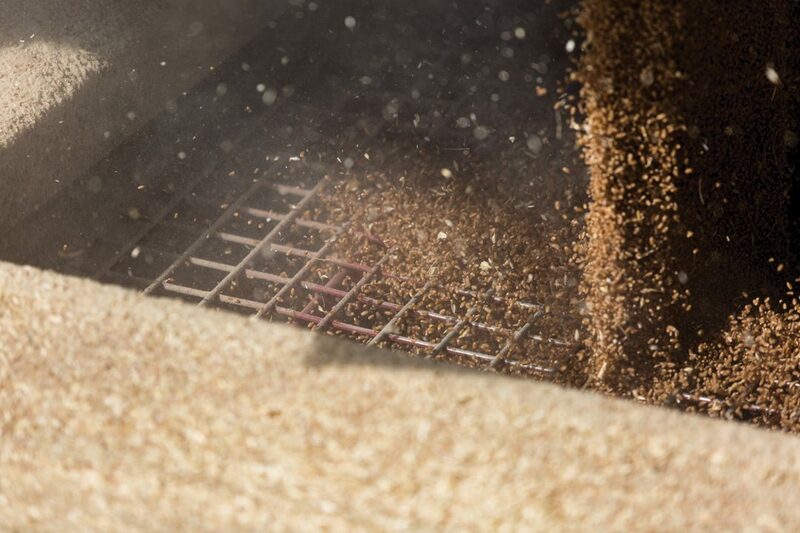 The CGC ensures certain criteria are met in relation to grading: Commercial relevance, an efficient process with consistent, reproducible results, and an acknowledgement of grain quality by farmers from growing regions across the country. If a system is well run, it will theoretically give buyers a quick and true look at protein content, as well as any and all factors they may take into consideration during their particular manufacturing process. This takes a coordinated effort on all sides, whether dealing with the huge volumes in 2013 or the unpredictability of 2014. This past harvest, farmers brought the conversation online, talking up storms and posting photos on social media and agriculture forums discussing degrading factors—from freak snowstorms and diseases to low test weights and atypical grain appearances—all of which underscore the need for an accurate, professional grading system. 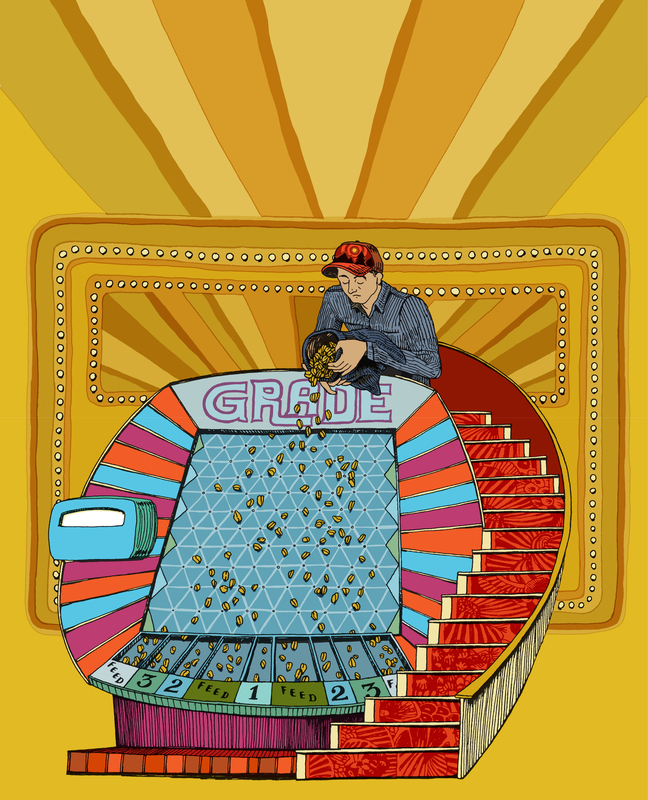 A farmer will typically first meet the grading system head-on when delivering grain to an elevator. The grain will then be loaded into rail cars and shipped to port or to a domestic or U.S. end user. Beswitherick explained that peas and malting barley, for example, are most often sold by “shipment by specification,” whereas wheat is sold by a regulatory grade. • Maintaining the grain-grading guide, the complete reference on the grading of grains, oilseeds and pulses, and gathering input from the Eastern and Western Grain Standards Committees to revise and update the guide annually. Both committees are made up of representatives of stakeholders such as growers, grain handlers and end users, and changes are made on the basis of consensus. • Preparing standard and guide samples for the industry on an annual basis and as necessary. For example, the 2014 mildew problem has not been encountered for two or three years. Guide samples refresh the standards for grading mildew for those on the front lines. • Official weighing and inspection at shipping ports, and issuing Certificate Finals to certify that cargoes meet the specifications of the sale contracts. • Performing a monitoring function using the expertise of the Grain Research Laboratory and Industry Services branches. Example outcomes of monitoring include: Italy’s approval of protocols for pre-shipment testing of ochratoxin (OTA) in wheat and durum for export; China’s acceptance of ongoing shipments of peas based on the CGC’s statistics for selenium levels; and the ongoing collection of pesticide residue data, which provides assurances to buyers of Canadian grain. Gerard Oosterhuis farms near Bow Island, about 150 kilometres from the U.S. border. Oosterhuis shops his samples around to three Canadian and two U.S. companies. Oosterhuis regularly ships grain to the U.S.
Oosterhuis noted that, although there are differences north and south of the border, they go both ways. Jeff Nielsen farms at Olds, in an area where quality can regularly take a beating due to the climatic conditions. While Nielsen streams samples when the grain is transferred to the bin at harvest, he generally does not get an independent third-party grade on it prior to shopping it around. Additionally, Sweeney noted that companies that market grain also have to manage food-safety risks and requirements to comply with import regulations in the various countries where they sell grain. Richardson’s frontline staff work to accurately interpret and verify the quality and food-safety characteristics of the crops they market, according to Sweeney. “A discount or cargo rejection due to a quality or food-safety deficiency is a risk we can’t afford from a financial and quality-assurance perspective,” said Sweeney. 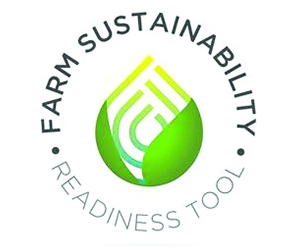 Staff at Richardson facilities use globally recognized food safety certification schemes (such as hazard analysis and critical control points, or HACCP) and train to stay up-to-date with national and international standards, Sweeney said. Furthermore, the company employs a corporate calibration program to routinely validate the accuracy of its equipment. 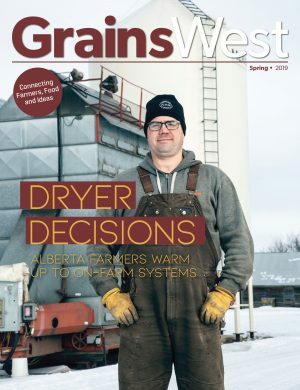 There are a number of third-party providers in the grain-grading business in Canada. These companies grade based on the Canadian or U.S. grading standards, take samples, provide training and serve any number of other functions on a fee-for-service basis. Norm Woodbeck is the manager of agri-operations for Canada at Intertek. Prior to taking on this position, he spent 37 years at the CGC, where his final posting was as acting chief grain inspector. His vast experience in grading stretches from coast to coast, and everything in between. Training in grain inspection is ongoing no matter where the grain inspector works. Post-CWB, farmers have the opportunity to truly saturate themselves with the vagaries and quirks of grain grading, said Woodbeck. “You are now the marketer,” he said. “It’s your responsibility to know your production—certainly protein, grade and moisture content. Dockage may vary. And you can also find out if your grain is a good, fair or poor representative of whatever it grades. That gives you more information about its blending capacity. “Variability is always part and parcel of inspecting grain,” he said. “The problems generally arise at the break line for a grading factor.